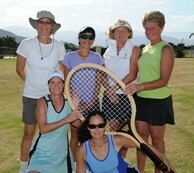 Indian Wells, Calif. – For the USTA Eastern Section 4.5 Senior Women’s team, home is where the tennis racquet is. Upon arriving at the 2010 USTA League 4.5 Senior National Championships, the team was asked to name their home city and facility. They listed Eastside Racquet Club in Syracuse, N.Y. as their home, but the Eastern Section women’s team could have actually listed almost a half-dozen places as their home. "We’re from various cities throughout Central New York," said team captain Elaine Heekin. "There are very few 4.5 senior women to pull from. There’s a wide span that we have to cover in order to find a team…it’s very, very difficult." Even though the USTA Eastern Section 4.5 senior women, who call themselves the Renegades, are spread out over Central New York, they are a dedicated bunch despite having to drive long distances to play matches. With team members coming from places like Cortland, Clinton, Syracuse, Ithaca and Fayetteville, the area spans two to three hours by car according Heekin. "We love the game so much, that we will get in the car and we will drive," she said. "It presents the challenge of driving in Central New York during the winter to get together," said Heekin as spoke about driving through sleet, snow, nasty weather. "The beauty of this is that we’ve been together a long time and this is our first time at Nationals," Heekin said. "We’ve been together for eight years. We’ve come close but never actually made it." According to Heekin, the time driving to matches helps the team. "I think it really makes the team stronger mentally. They take time and take the energy and get in that car, even it it’s not great weather and we make time to play and bond," she said. "We never play at the same facility. We’re just vagabonds," said Heekin as she explained that the team rotates around various locations so members don’t have to consistently travel far for matches. "We’re a regional team," she added.